← Now that’s a beautiful bag! I read a great book on Chinese manufacturing last year. It’s titled Poorly Made in China, An Insider’s Account of the China Production Game and was written by Paul Midler. Paul’s book details how Chinese manufacturing firms shave costs in production in order to improve their bottom line. Now, that probably is not a big deal for a lot of products. If some Chinese apparel firm wants to put in ten stitches an inch rather than fifteen stitches an inch on a sweatshirt, probably no big deal. But for some products, cutting corners in production can kill people. So I was horrified to read a story about counterfeit Chinese airbags being installed in automobiles being sold in this country. During testing by the National Highway Traffic Safety Administration, “the counterfeit airbags consistently malfunctioned, with results ranging from a failure to deploy to shooting flames and propelling metal shrapnel into the test dummy.” I don’t know about you, but during a crash in my car I am prepared to accept metal shrapnel being propelled at me by the other car, but not from my own airbags. So if you are in an accident and your airbags deploy, I would make darn sure that the replacement airbags are manufactured by members of our extended American family rather than some fella in the Middle Kingdom. 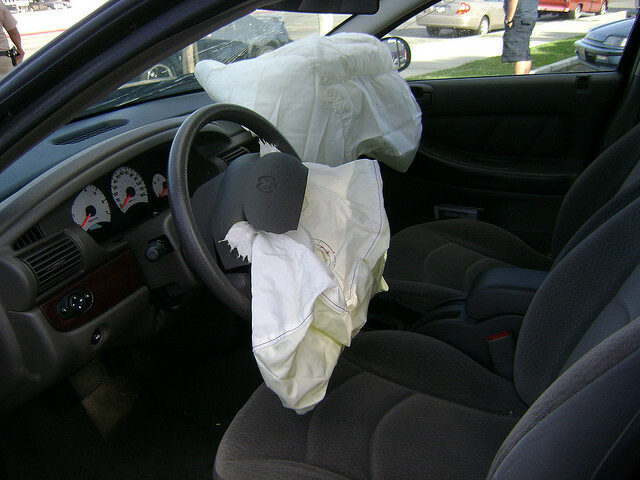 If there is a price difference between American manufactured airbags and Chinese airbags, I would suggest you pay it! This entry was posted in american made, Automobiles, China, Made in America, made in usa and tagged Airbag, Automobile, Automotive industry, China, counterfeit chinese airbags, Made in America, made in usa, National Highway Traffic Safety Administration, United States. Bookmark the permalink.